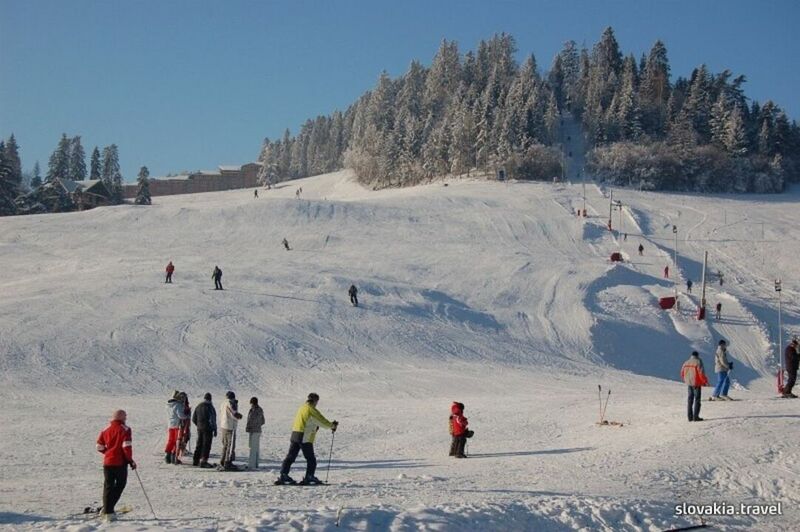 Lyžiarske stredisko Ski Park Vyšné Ružbachy sa nachádza v regióne Pieniny/Severný Spiš. Základná stanica sa nachádza v nadmorskej výške 640 m n.m. a najvyššie položený bod strediska je vo výške 808 m n.m., celkové prevýšenie teda predstavuje 168 metrov. Lyžiarska sezóna sa v stredisku Ski Park Vyšné Ružbachy začína v decembri a trvá do marca. Celková dĺžka zjazdoviek je 3,3 km a z nich je 2,4 km umelo zasnežovaných. V areáli strediska Ski Park Vyšné Ružbachy sa nachádza 5 vlekov s celkovou prepravnou kapacitou 2400 osôb za hodinu. Kombinácia ľahkých a stredne náročných lyžiarskych terénov je vhodná pre začínajúcich lyžiarov, no zároveň poskytuje možnosť zdokonalenia techniky lyžovania. Rodičia s deťmi majú možnosť využiť detský vlek, ktorý sa nachádza v areáli strediska. K ponuke je aj večerné lyžovanie s dĺžkou osvetlených tratí 800 metrov. Located in Vyšné Ružbachy spa town and the Spa Vysne Ruzbachy reachable within 2297 feet, Penzion Zet offers accommodations in rooms and apartments, a garden and a terrace. Free WiFi is available in all areas and free private parking is possible on site. Set in the heart of Vysne Ruzbachy Spa Area, Grand Hotel Strand is an elegant 4-star hotel. It offers thermal outdoor and indoor pools and a spa. Free Wi-Fi is available throughout the property. Situated 1 km from Stará Lubovňa town centre and the Litmanova Skilift reachable within 9 km, Hotel Familia offers en-suite accommodation, a restaurant, a bar and a terrace. Situated in the centre of Stará Ľubovňa, Penzión Gurmen houses a wine cellar and a restaurant with a bar, and provides air-conditioned rooms. Located in the town of Stará Ľubovňa, set in a historical building and the Lubovna Castle reachable within 1.9 mi, Penzión a Reštaurácia u Jeleňa offers accommodations in rooms, a restaurant, a bar, a terrace, billiards and darts. Free WiFi is available in all areas. The burgher’s house is an urban museum depicting the life of middle-class citizens in Stará Ľubovňa at the end of the 19th century. The exposition gives an insight into furniture style which is retrieved by figures dressed in antique costumes. Chata Čučoriedka Litmanová offers accommodation in Litmanová, 50 km from Zakopane and 37 km from Białka Tatrzanska. Stará Ľubovňa can be proud of its unique medieval army camp in the settlement around the castle presenting a picture of military life of the 16th century. It serves as an ideal place for summer camps, outdoor schools, trips and for all those who want to experience middle ages on their own. The Museum of Folk Architecture, which is located at the base of the Castle Ľubovňa in northern Slovakia, represents a separate exposition. It features a set of traditional buildings from the surrounding villages, which, coupled with the Castle, gives rise to unique and highly impressive scenery. On a limestone cliff of 711 m over Stará Ľubovňa in the north-east of Spiš stands Ľubovňa Castle. Rulers met here in the past, it is the place where Polish coronation jewels were hidden and where famous adventurer, noble man and King of Madagascar, Móric Beňovský was imprisoned. The mountain Zvir in Litmanová is a Marian spiritual place of pilgrimages and a place of apparition of the Holy Virgin Mary. The Mother of God appeared to two girls, at that time the 11-year old Iveta Korčáková and the 12-year old Katarína Češelková in a small room of a wooden hay-barn (majdán) which is located there on a meadow surrounded by forests until today. The Roman Catholic wooden church of Immaculate Conception of the Virgin Mary from 1785. It is a single nave log building which serves to the Roman Catholic believers and those of eastern ritual. Its interior decoration is varied. It contains icons and fragments moved here from the church in Stará Ľubovňa. Hotel SOREA ĽUBOVŇA is located in the picturesque valley of Lubovňa Spa on the border of Spišská Magura and Levoča hills, 7 km from Stará Ľubovňa. The region is known with its mineral springs and the hotel provides a wide range of additional sports and relaxation services. WiFi access available in the public areas. Skalná ihla je viac známa pod názvom „Čertova skala“ – kamenný výtvor, ktorý je vysoký 12 m a spája sa s ním povesť spojená s výstavbou Ľubovnianskeho hradu. Nachádza sa v nive rieky Poprad asi 2,5 km od obce Chmeľnica. Od roku 1989 je tento prírodný výtvor vyhlásený za prírodnú pamiatku. Featuring free WiFi and a restaurant, Chata Pieniny offers pet-friendly accommodation in Lesnica, a 30-minute walk from Szczawnica. The guest house has a ski-bus, a ski school and guests can enjoy meals at the restaurant. Free private parking is available on site. Each room has a flat-screen TV with satellite channels. Certain rooms have a seating area to relax in after a busy day. All rooms are fitted with a private bathroom. Oddýchnite si v rodinnom priváte v historickom centre starobylého spišského mestečka Spišská Belá. K dispozícii vám ponúkame 5 izieb s celkovou kapacitou 19 lôžok. Spišská Belá je vzdialená 22 km severne od Popradu, 7 km rovnako severne od Kežmarku, 25 km juhozápadne od Starej Ľubovne a 54 km východne od Zakopaného v Poľsku. Situated in Spišská Belá, V Penzión offers a terrace. Free WiFi is available. All guest rooms in the guest house are fitted with a flat-screen TV. Each room is equipped with a private bathroom. The ruins of the Plaveč Castle from the 13th century adorn the top of the hill towering above the wide valley of the Poprad river. It is an ideal place for unique views.